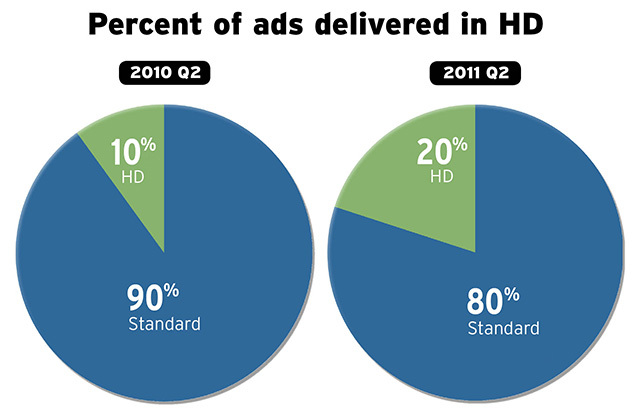 Since the second quarter 2010, the number of ads delivered in HD has doubled from 10% to 20%, according to a new study from Extreme Reach. Of course, that means that 80% of ads are still delivered in standard definition. The report draws on a sample of 171,000 SD and HD commercials over the three-month period between April 1 and June 30, 2011. That figure roughly coincides with the percent of TV viewing that is done in HD, according to Nielsen which notes that while HDTV sets are in use in the majority of American households. Advertisers point to distribution and production costs and uneven adoption of HD in local markets as factors inhibiting the growth of HD delivery, according to Extreme Reach. In the last year costs have decreased and adoption has increased leading to the increase in HD ads. At the local level, nearly half of local TV stations now distribute HD and 63% of local cable operators. Nearly all HD outlets accept HD ads digitally. Clearly, there is still a lot of room for growth here, and we're starting to see regional and local advertisers joining the major national brands.